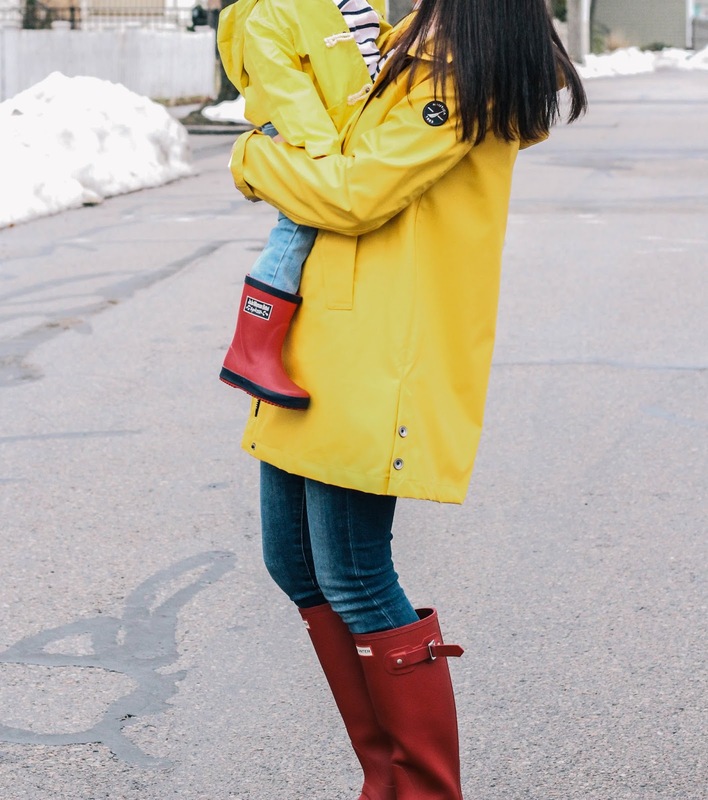 Even before I was pregnant I used to imagine twinning with my little girl. Since I grew up with a sister and am the oldest of a large extended family of mostly girls, the notion that I could possibly give birth to a boy pretty much eluded my mind. But on the day Bennett was born and I heard “It’s a boy” in the delivery room I felt nothing but excitement. Although bringing up a little boy was unfamiliar and slightly frightening to me at first, everything has felt surprisingly natural so far. 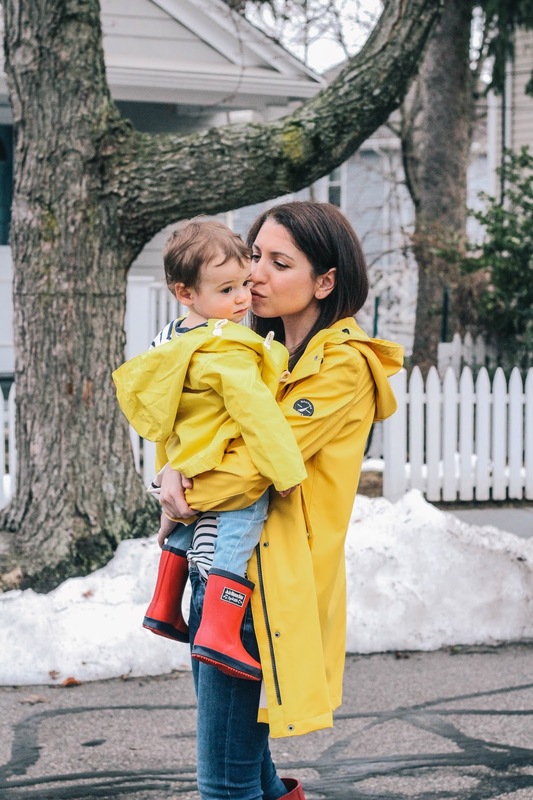 And although I’ve accepted the fact there aren’t going to be many times Bennett and I could pull off matching outfits, I thought a classic yellow raincoat and wellies on a rainy Boston day could be an exception. 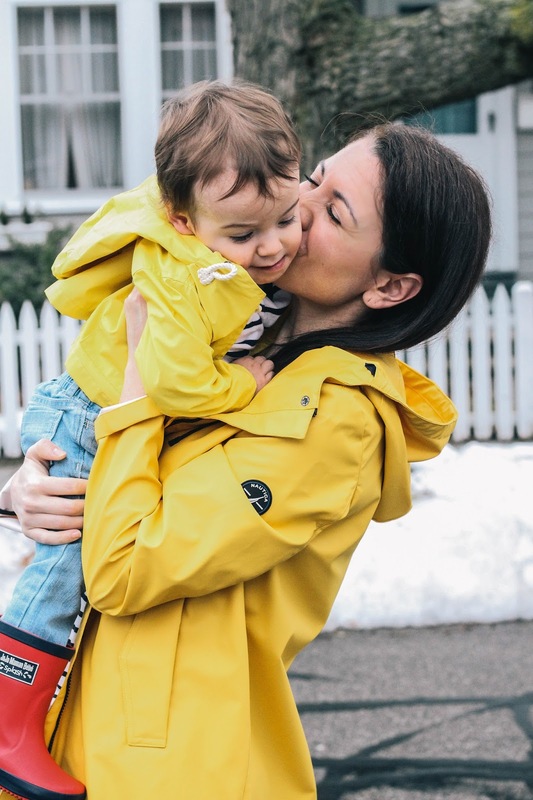 Bennett’s precious yellow raincoat actually came as a set with the stripe shirt he’s wearing and a pair of navy pants. 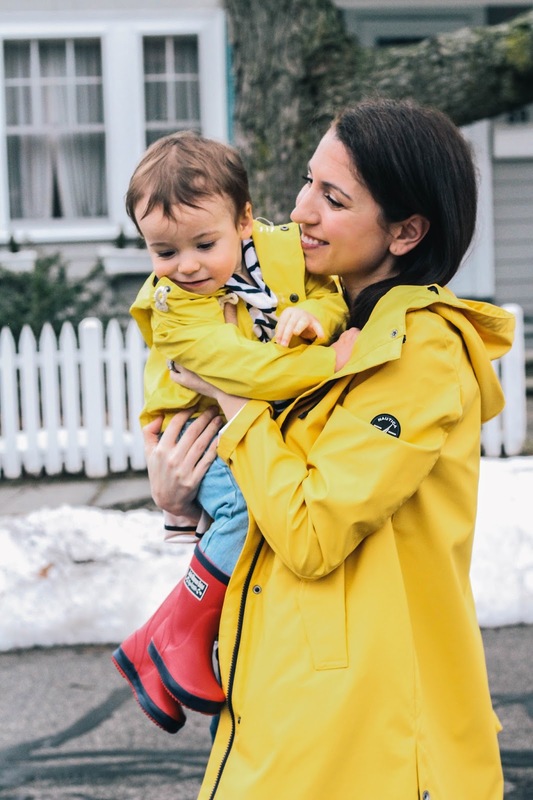 My raincoat is by Nautica, and I absolutely love it! 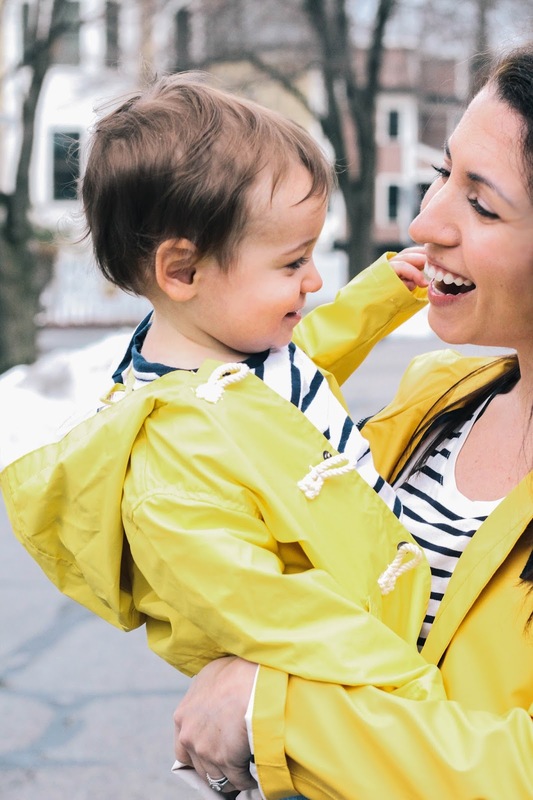 The A-line shape of the coat is so flattering, which is refreshing since I’ve tried on too many water-resistant coats that have turned out to be a disappointment because they look too boxy. It’s currently ON SALE and runs big, so size down. 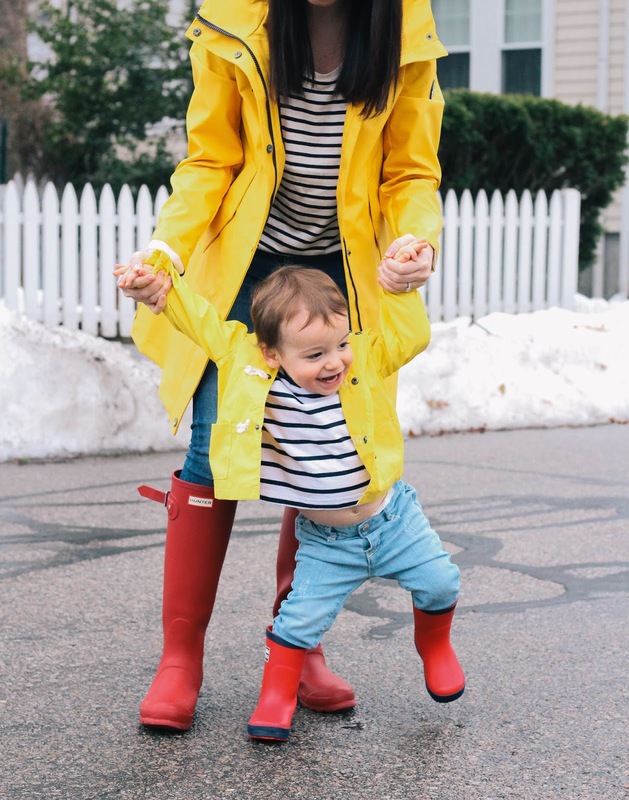 Navy and white stripes under a yellow raincoat is such a cute, classic combination. My stripe shirt is from H&M and under $10! My red Hunter boots get so much wear especially in the spring. 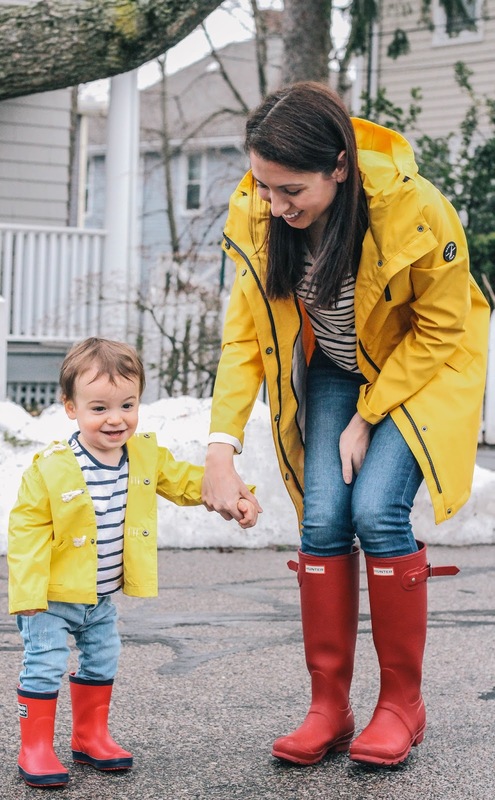 I apologize that I keep repeating myself, but Hunter boots are an amazing investment. My boots are in just as good of condition when I first bought them and they’ve conquered a lot of unrelenting New England weather. 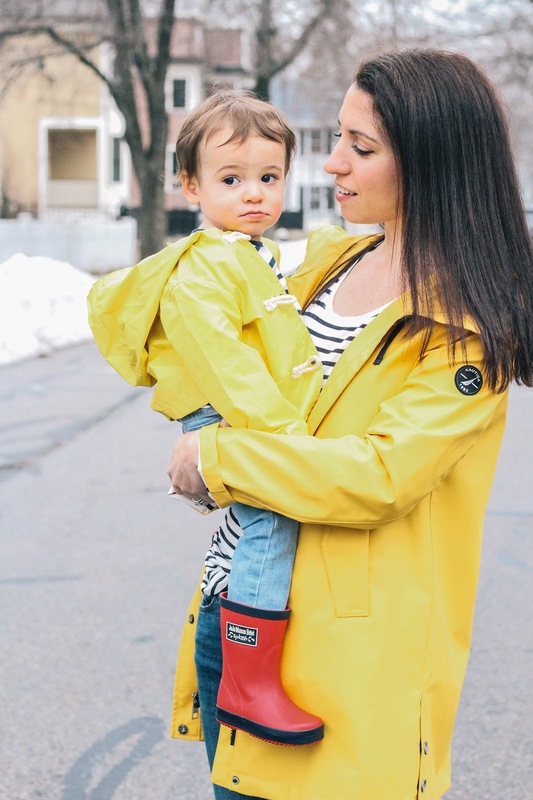 Bennett’s wellies are by this adorable company called Jojo Mama Bébé! 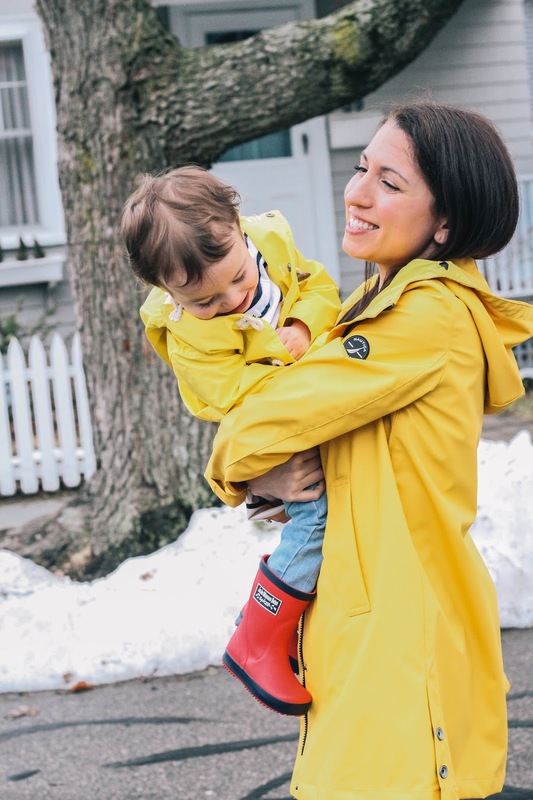 Although they carry some amazing kids wear, their rain boots are my favorite! Scrolling through these images, I can’t help but wonder where my baby has gone. 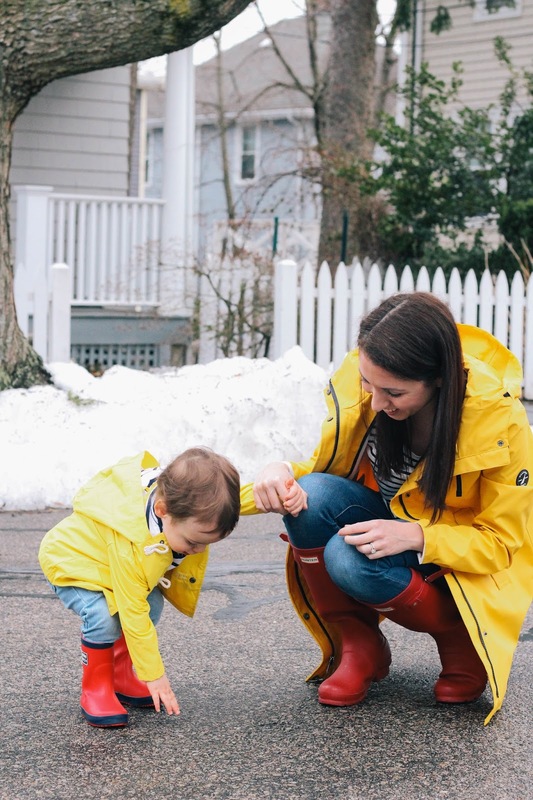 He looked like quite the boy clumsily wandering around in his little rain boots. Now that he’s started walking he’s always wanting to be on the go and it’s becoming more rare that my little adventurer wants me to hold him. I’m just sure to steal extra snuggles and kisses every time I do to make up for it.